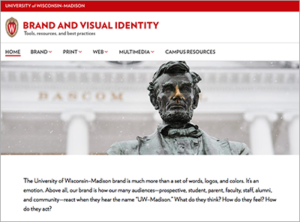 UW–Madison’s Brand and Visual Identity website explains the vision and rationale for UW’s brand. Included are guidelines for conveying the UW crest, typography and colors on websites, print materials, photography, videography, Power Point and social media in a way that generates immediate recognition of the UW–Madison brand. The UW Athletics Style Guide (PDF) presents guidelines for the approved representation of University of Wisconsin Athletics. It introduces the key typography, sizing, and more — for highly recognizable marks including Bucky Badger, the Motion W, and other athletics logos.